First of all, how did I not know about the wonderful Gender Across Borders website until today? 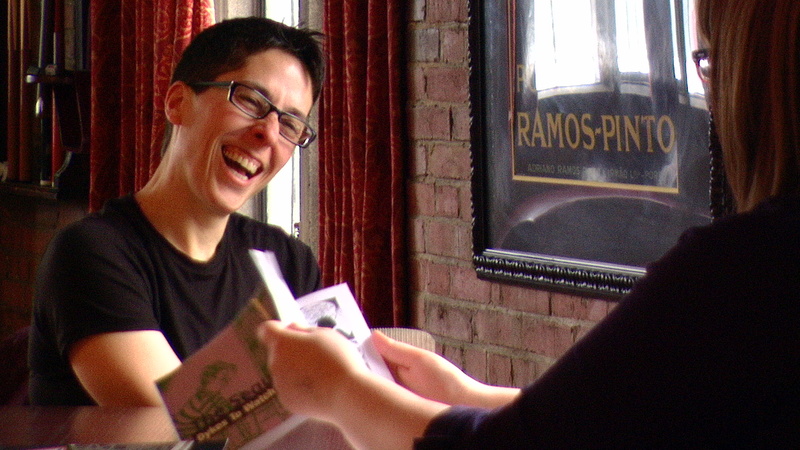 It has a lot to mine, but it had me enamored with this vibrant Alison Bechdel interview. Bechdel, of course, is the author of the graphic novel Fun Home: A Family Tragicomic and the long-running Dykes To Watch Out For strip. This year, she is the Dedmon Writer-in-Residence of 2010 at the University of Chicago and is at work on her upcoming book, tentatively titled Love Life: A Case Study. I also happen to be a little in love with her. My affection is inflamed after Bechdel's conversation with Roxanne Samer about "the creativity that autobiography allows, how she came to stop using color, her take on academia and its recent attention to her work and much more." RS: Yeah, you definitely gained flexibility with Fun Home. It’s a totally different project. The lack of linearity…I mean, something is propelling the story forward, but you are continually jumping back and forth through time. AB: Yeah! I love trying to find that propulsion—what is that thread through which the events of life [can be connected]. I love trying to find that and put it down. And with the comic strip, I would always know what I would be doing ahead of time. There was not a lot of surprise. I would know what was going to happen, what the issues were, and it was fine. This [Fun Home] is more adventurous. Autobiography is more adventurous in an odd way. It seems almost counterintuitive—you know what happens in you life, but for me its more exciting than writing a fictional world.